A heartwarming and moving story about secrets, fresh starts and the power of friendship, set in the wilds of Ireland’s shores. Maeve McKenna is on the verge of a breakdown. Having worked herself into the ground as a sought-after interior designer in London, she’s in desperate need of a vacation. Philomena Duffy is a little lonely. After losing her husband, their crumbling mansion, Willow House, feels awfully empty. With the rugged shores of Ireland calling, Maeve visits her aunt Philomena in Sandy Cove, where she once, as a teenager, kissed a wild, mysterious boy – a kiss she has never been able to forget. The beautiful night’s sky is dotted with stars as far as the eye can see, and Maeve is worlds away from her chaotic life in the city. As Maeve throws herself into restoring Willow House to its former glory, a deep friendship with Philomena begins to blossom. Surrounded by the faded walls and peeling carpets of the old mansion, together they stumble across a secret that turns their family upside down. All the while, she can’t stop thinking about the enigmatic boy from her past, and that magical kiss… Is he still in Sandy Cove? Just as she’s beginning to feel at home, reality calls. Part of Maeve can’t bear to leave Willow House and its rocky beach. Does she have the courage to leave the security of her old life behind, and put down new roots in Sandy Cove, or is that just a daydream? Fans of Sheila O’Flanagan, Debbie Macomber and Mary Alice Monroe will fall head over heels for this stunning read. 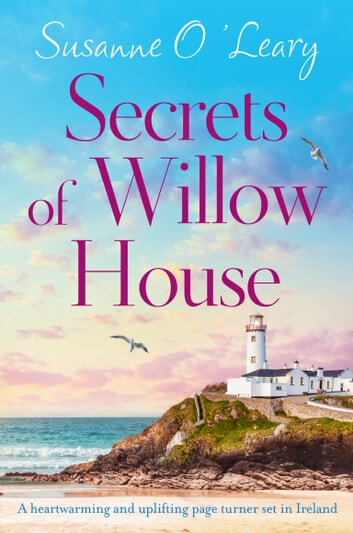 The Secrets of Willow House is a modern Irish tale set in Kerry, in the NW sector, peopled with characters who share with you their secrets and strengths. I adored Maeve and her Aunt Phil, as well as Oliver Taylor and Paschal - the ladies have excellent taste and even better luck - but it takes a bit of doing to get them on the right track. But is the right track headed right through Sandy Cove, or is it in the more entertaining, fast-paced London? And who are Betsy Malone and Fanny l'Amour? What role did they play in the last days in the life of Uncle Joe? Susanne O'Leary is an author I will watch for, one I am pleased to refer to friends and family. Her descriptive passages about Kerry and the Skellig Islands had gotten them added to that old bucket list. I received a free electronic copy of this Irish novel from Netgalley, Susanne O'Leary, and Bookouture in exchange for an honest review. Thank you all for sharing your hard work with me. 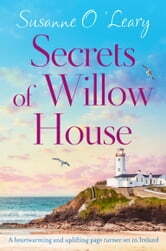 Secrets of Willow House is completely delightful! Forced by her doctor to take a vacation or risk a heart attack, interior designer, Maeve goes to Ireland to visit her Aunt Philomena. Phil, as she is known, asks Maeve for help sorting out her late husband’s computer files and help her determine where the money in that secret bank account came from. Just what was her uncle up to in his retirement? The answer it would seem is quite a lot...but I give no spoilers. Along the way Maeve meets some very interesting people that bring a new perspective into her busy life. Readers also become surrounded by the sounds, smells, and traditions of Ireland, always a plus. This is a well written story with developed, relatable characters, and I greatly appreciated the lack of major angst that can bog down otherwise good stories. In short, I totally enjoyed the time spent reading. I voluntarily reviewed an advance copy of this book. Most highly recommend.